This site is for your personal use only. You may not distribute exchange, modify, sell or transmit anything you copy from this Site, including but not limited to any text, images, audio and video, for any business, commercial or public purposes. If you comply with the terms of these Terms & Conditions of Use, Made to Measure Windows grants you a non-exclusive, non-transferable limited right to enter and use this Site. You agree not to interrupt or attempt to interrupt the operation of this Site in any way. All materials on this site, everything including images, text and connected software is owned or licensed to or by Made to Measure Windows and explicitly cannot be used unless prior agreement has been given. Made to Measure Windows reserved the right to change these Terms & Conditions of use or Content on the Site at any moment. We don’t collect personal data from our website automatically, the contact forms on our website is the only way we Made to Measure Windows collect data from our website. If you have contacted us previously and would like us to remove your data from our system, all you must do is send an email to: made2measure@btconnect.com with your name, phone number and email address followed by PLEASE REMOVE MY DATA in the emails subject field, this will allow us to track your data and remove it from our systems which we will do within 7 days of the request. 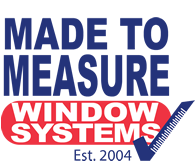 Personal information is collected by Made to Measure Windows will be used to contact you regarding your enquiry or for any future marketing correspondence from Made to Measure Windows. We collect personal information from you using enquiry forms or quote forms and every time you e-mail us your details. We process personal information collected via the Made to Measure Windows website for the purposes of: - providing you with information about products and services we offer. Made to Measure Windows website contains links to other sites. Please be aware that Made to Measure Windows is not responsible for the privacy practices or content of such other sites. This privacy statement applies solely to information collected by this website.